George VI was king of Great Britain and Northern Ireland from 1936 to 1952. He guided his country through World War II and the years of rapid transformation that followed. Prince Albert, as George VI was generally known during his early years, was the second son of the Duke of York (later George V); he was born at York Cottage, Sandringham, on Dec. 15, 1895. Although a sensitive, shy, and at times nervous child, he was happy and possessed a determined spirit. In 1909 he entered the Royal Naval College at Osborne and 2 years later went on to Dartmouth. At both institutions he won the respect of his teachers and his classmates. Afterward he entered the navy professionally. During the first years of World War I the prince served on the battleship Collingwood and later on the Malaya and while on the former participated in the Battle of Jutland (May 1916). Periods of illness, however, interrupted his service. Later in the war he was appointed to the Royal Naval Air Service, and in 1919 he became the first member of the royal family to receive a pilot's certificate. After the war Prince Albert spent a year at Trinity College, Cambridge, where he proved to be a keen and diligent student. In 1920 George V created him Duke of York, and in this capacity he developed a special interest in industrial problems. His famous youth camps, where schoolboys and boys from industrial areas could spend weekends, were inaugurated in 1921. In 1923 he married Lady Elizabeth Bowes-Lyon, and the two became a model royal couple. They had two children: Princess Elizabeth (April 21, 1926) and Princess Margaret (Aug. 21, 1930). Throughout the years between 1919 and his accession the Duke of York traveled widely. He gained a new confidence in himself and won the esteem of others. When his brother, Edward VIII, abdicated in 1936, the duke ascended to the throne as George VI. The new king brought to the monarchy a dignity, a compassion, and a broad understanding of human problems which served him well and compensated for his limited knowledge of political matters. As king, George VI continued to display the qualities that characterized his earlier life. He proved to be a valuable source of advice for his ministers. In 1939 the King and Queen went to Canada in a precedent-breaking trip which was successful beyond expectations. As a result of this visit all talk of Canadian neutrality in the event of war ceased. That June the royal family proceeded to the United States, and the King became the first reigning British sovereign to enter that country. Throughout World War II he furthered Anglo-American unity. During the war he painstakingly carried out his many responsibilities and, together with the Queen, became a frequent visitor to the devastated areas of England. He identified with his people in their common suffering and gained their admiration. In postwar years he presided over far-reaching changes in the domestic and colonial realms. He died on Feb. 6, 1952. 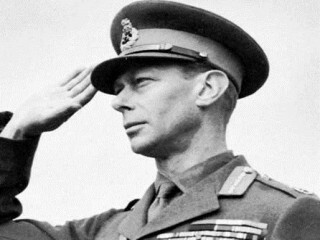 View the full website biography of George VI Of U.K..